Mailchimp offers three pricing plans: Forever Free, Monthly, and Pay As You Go. With our Pay As You Go Plan, you buy email credits as needed. The credits don't expire, so it's a good option for users who send infrequently. In this article, you'll learn about the Pay As You Go Plan and how it works. Units of payment that are used for the Pay As You Go Plan. Someone whose email address is stored in your audience. There are four types of contacts in Mailchimp: subscribed, unsubscribed, non-subscribed, and cleaned. A term we use to measure the number of email campaigns you send. Each email sent to an individual contact counts as one send. For example, one campaign sent to 2,000 contacts equals 2,000 sends. Test emails also cost one Pay As You Go credit per send. A recurring plan that charges once per month based on total subscribed contact count or send volume, and includes additional features exclusive to paid plans. Mailchimp's free, introductory plan that allows you to send 12,000 total emails per month and have up to 2,000 total subscribed contacts across all audiences in the account. The Pay As You Go Plan comes with a set of features exclusive to paid plans, like Social Profiles and Timewarp. Here are some examples of paid features that come with a Pay As You Go Plan. • Conversations lets you view and respond to contacts' replies to your email campaigns from inside your Mailchimp account. • Chat support gives you one-on-one access to Mailchimp support agents. • Advanced forms allow users familiar with custom coding to get creative with Mailchimp's hosted signup forms and response emails. • Timewarp schedules campaigns to go out at the same time in different time zones. • Predicted Demographics uses data science to predict the gender and age of your contacts. 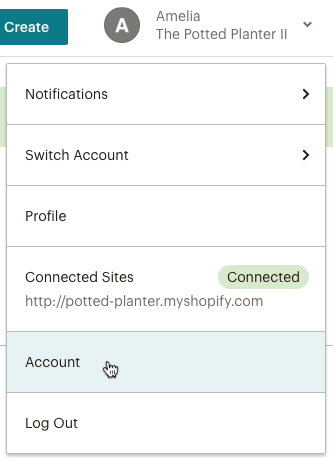 This Mailchimp Pro feature is also available to paid users who connect their store to Mailchimp. • Social Profiles gathers social data about your contacts. The Pay As You Go Plan operates on non-expiring email credits that you purchase based on your sending needs. Credits are like postage stamps, where each email sent to an individual contact costs one credit. For example, to send one email campaign to 1,000 contacts, you would need 1,000 credits. This type of plan works best for infrequent or inconsistent senders, such as users who send quarterly newsletters or promote seasonal events. To find out if the Pay As You Go Plan is right for you, estimate your costs with our price comparison calculator. Pay As You Go credit blocks start at $150 for 5000 credits. 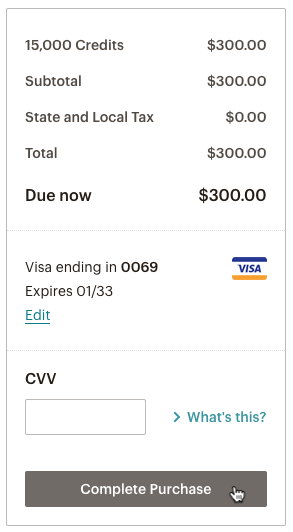 These credits cannot be used together with another Mailchimp pricing plan. 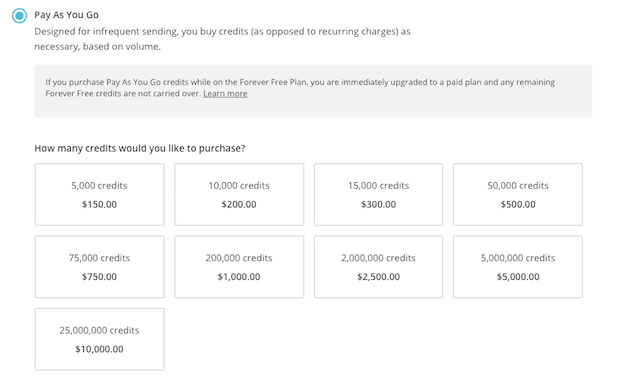 If you purchase credits while on the Forever Free Plan, you'll be upgraded to the Pay As You Go Plan immediately, and any remaining Forever Free sends are not carried over. If you purchase credits while on the Monthly Plan, we'll stop your monthly billing cycle and switch you to the Pay As You Go Plan. 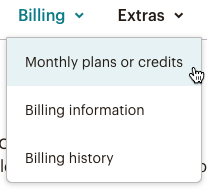 To make sure you never run out of credits, you can set a threshold for minimum number of credits allowed in your account. Ask us to email you when your credits fall below that threshold, or choose to be automatically billed for a credit block of your choice. When your credits drop below that threshold, we'll automatically bill your account for the credit block you chose. We recommend you maintain a store of credits equal to or greater than the number of planned sends. 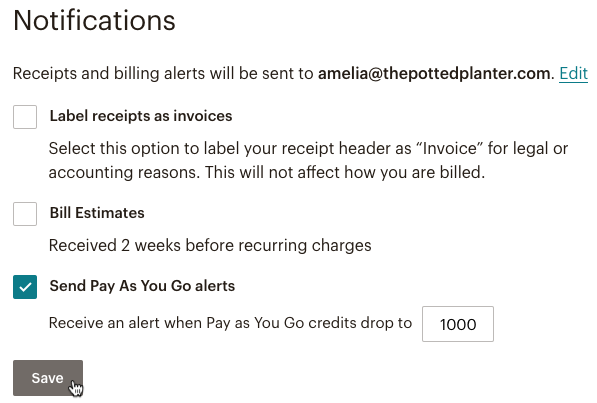 If you don't want to be automatically billed when your credits fall below a certain amount, you can choose to be notified by email instead. When your credits fall below that threshold, we'll send you an email with a link to buy more credits.